I have 3 girls and one boy and let me tell you, I have more fun shopping for my son then my girls! I'm so glad you're having a boy! There is something about the love a mother has for her son, it's indescribable! #13 could be the cutest ever!!! I have two cousins with boys due, my boss is due with a boy and I am having a blast shopping for them!!! They are super super cute!!! Congrats to you and Tyson!!! Number 5 is perfect for my little boy! He loves dinosaurs and walks around with his Rex from Toy Story saying Rawr! to everyone! This kid is already so blessed. Y'all are going to be great parents. I wish you and your family all the best. I love the sock monkey and the rawr picture! I can't wait to get knocked up again, So I can get some of Susan's baby moccasins! Also I agree boy's are just as fun to shop for! Awww!!! I totally know what you mean...baby boy shopping is sooo much fun!! are you kidding me?! I am making that print. right now! adorable! #1. 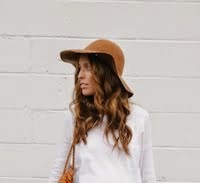 You are the cutest pregnant person I have ever seen. #2. Congratulations, you will LOVE having a boy! #3. They are totally fun to shop for...although once they are of walking age I have a rule, If a grown man wouldn't wear it.... don't put it on your little boy. Hee Hee! I love shopping for my little 2 yr old! We find the cutest clothes for him and everyone ooh's and aww's over him at church on Sunday more than any baby girl in the ward! yay, i'm do excited for you...i just had a boy 11 weeks ago and it is soooo fun to shop for him (i have two older girls too). plus your boy will ja'dore you waaay more than the girls. having a boy is like a little eggo boost...for the rest of your life. he will be the best dressed boy eva. I LOVE shopping for my son. I have practically given him his own fashion blog! Congratulations! You will be a great mom! Ahh soo exciting! I have nephews and they are the funnest! My sister just had a baby boy and named him Deacon... and boys LOVE their mama's! I used to think of that, but when I had my little boy for the first time, I thought they're just as fun as shopping for little girl's clothes. I am sure your little boy would look as fashionable as mama or even cuter. LOL! I've got to say, girls are pretty awesome to shop for, but this cute boy stuff makes me feel better for if we have a boy someday. And that little hoodie- oh my star. So cute. yaaaaay, its a lil gentleman! i'm about 2 weeks behind you...can't wait to find out what its going to be. my motherly instinct says boy too, so if so, your shopping list shall come in handy! i adore those suspenders and bow tie :) congrats to you darling!!! Yay - I thought it would be a boy! I love boys! Awhhh, we have four girls and I have always wanted to have a little boy to shop for! I think boy clothes are the cutest ever!!!!!! So excited for you, and I bet the nursery will be so adorable too!!!!!! Every single one of those items are adorable! Keep the cute little boy ideas coming! I'm having one in October! Congratulations on yours!! Boys are seriously a blast!!! Dirt, trucks, and weapons. They don't need much else. You'll seriously have the most adorable little fella in all of Idaho! thank you for the fab ideas, I have two boys. They are so fun, you are in for the time of your life. seriously. I want all boys. ALL BOYS. All of 'em. A whole football team of them. ...Er... Or something. But I agree! Boys have the greatest stuff. IT'S A BOY!!!!!!!! Congrats Syd! I love # 13, sooo cute! Congratulations!! Whenever I shop for my little girl all I can do is drool over the cute little boy things. There are so many adorable boy clothes! boy stuff is SO cute! congrats!!! That dinosaur print is the best thing I have ever seen in life. SO CUTE. goodness. those sweet little moccasins are the cutest ever. Congrats and have LOADS of fun! Babies in general are the most fun to shop for! There's definitely a marshmellow shooter in my baby's future! That print is amazing !!!!!!!!!! Boys clothes are fun too, the only problem is they sell out faster, so you need to hit the stores as soon as the new collections are coming out ! Congrats again, you're gonna love having a little man in your life ! Great picks!!! Your right, the boy stuff is getting better and better! I have a 4 yr old boy and another lil boy bundle due any day now and this time around, I'm finding killer stuff!!! so fun and congrats syd!! you were fast! this stuff is all adorable. definitely sharing with my friend who is also having a little guy! I have number 3 :). Mason loves it but My sister bought it for him because that was my toy growing up. You know the one that you can't go to sleep unless you have next to you. I have since traded the sock monkey for my hot wife. Love the pendelton blanket. Congratulation on the baby it's so exciting it's a little boy!! So excited for you Sydney. I totally guessed it was a BOY!!! 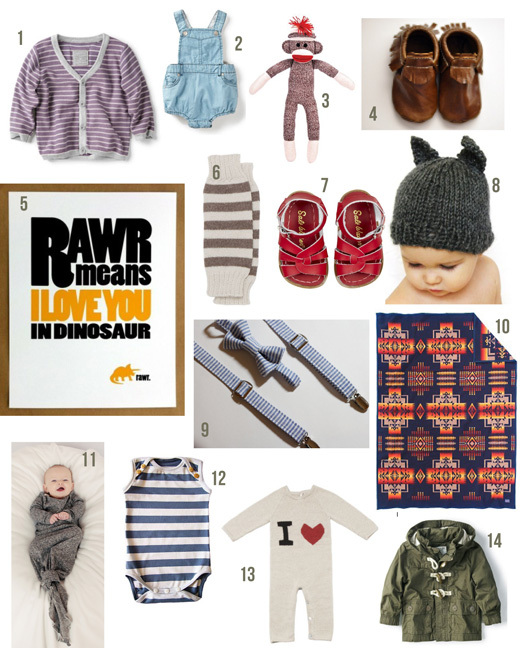 And I'm loving the "RAWR means I love you in Dinosaur". That's too precious & funny! Amen to that!! LOVE #11 and 12! Cuteness! We are three girls and I have been wanting a boy ever since I knew I was pregnant. He is three now, and I have to tell you, it's soo much fun decking him out, there are such colorful and cool outfits out there for boys. Love it all! You're going to have the best dressed kid in town. Congratulations! My sister in law is pregnant with twins boys and I agree, shopping for boys has been a blast! ahhh. The hat! With the ears! There are no sufficient words! If you don't get that hat for your son I may have to stop reading your blog. I love baby boy shopping. Little sneakers, little sweaters, little cute button ups. I can't get enough. LOVES! no. i used to babysit for a couple with three boys. SO CUTE. They had the absolute cutest clothes and most adorable nurseries ever! You're gonna have so much fun dressing him and decorating for him! I about died when I saw that little beanie (#8). Love it!! Little boys' nurseries are fun...a dino theme (#5) would be perfect! i think shopping for boys and girls is equally fun.... little boys always have cuter shoes!!! love your choices... especially #12 and #14!! Eek my sister in law is having my first neice/nephew in September and I really want to get that #11 the knottie sleeper - i just wanna hug a baby in that adorable thing!! I have a son and I LOVE shopping for him also!! I love having a boy! Last night he read "Love you forever" to me on his own. That book is our favorite, it ALWAYS makes me cry. I love that dinosaur print!! Congrats again!! Boys are precious. Ahh! I can't wait to see what you put together. You will obviously have the most precious and fashionable little boy! Congrats!!! Congratulations. I actually guessed it right! :D I hope you enjoy shopping for your baby, gorgeous lady! I'm due in December and at this point, if the early sonograms are correct, we're having our second boy. Boys are so much fun-and creating their rooms are a BLAST! Congratulations! Adorable. I'm with you...I'd much rather shop for little boys stuff...so freakin' cute! Little girls stuff gets so repetitive...pink, purple, flowers, princesses, over and over and over and over. Agreed. I had so much fun shopping for my little guy, Max, when I was pregnant and still do!! They make such adorable things for boys! Love your finds. How cute! I would love to buy these things for my cute little nephew. You're right - buying for little boys can be just as fun! I love shopping for my boy! :) it is more challenging to find cool stuff uti find that fun. It's not hard at all to find cute boy things if you have all the money in the world. I like to buy second hand as much as possible to save money. Buying second hand or finding affordable adorable boy clothing is my challenge. Boys just destroy their clothing more than girls.